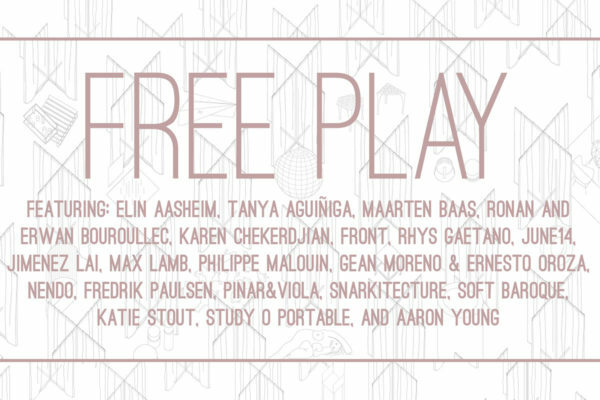 Join the Museum of Contemporary Art Santa Barbara for the opening reception of Free Play, an exhibition that brings contemporary furniture, architecture, artworks, and objects from an international scope of designers, architects, and artists to Santa Barbara. We will also celebrate the opening of the latest exhibition in the Bloom Projects Exchange Series, titled Silvestre Pestana, Breathless. Exhibition receptions are open to members only. Not a member? Click here to join today! Or, sign up at the door! MCASB commissioned acclaimed design expert Alexandra Cunningham Cameron to curate Free Play. The exhibition centers around the idea of play as an influential actor in the design process, producing work which intimately reveals our drive toward novelty, upending traditional notions about the role of design in our lives. Each creator shares an alternate view of the world through objects which appropriate childhood motifs, employ satire, and generate form through chance. This sense of freedom results in works that are wonderfully illogical, whimsical, and poignant. The exhibition design, by Berlin-based Sam Chermayeff Office, is a labyrinth of personal moments and stories. The impressive lineup of creators included in the exhibition features names such as Maarten Baas, Design Miami/'s 2009 Designer of the Year; nendo, named Designer of the Year by Wallpaper Magazine, Elle Decor, and Maison & Objet in 2015; LA-based Jimenez Lai, founder of Bureau Spectacular; and Snarkitecture, whose installation piece The Beach has been touring globally since 2015. Katie Stout, the 2015 winner of HGTV's show Ellen's Design Challenge and who was recently named to Forbes' 30 Under 30 list, will present Pepita, a work commissioned specifically for Free Play. Philippe Malouin, recently awarded Abitare and designboom's Design Prize, will create three tables for Free Play entitled Marbles. Rounding out the list of included creators are Elin Aasheim, Tanya Aguiñiga, Ronan and Erwan Bouroullec, Karen Chekerdjian, Front, Rhys Gaetano, June14, Max Lamb, Gean Moreno & Ernesto Oroza, Fredrik Paulsen, Pinar&Viola, Soft Baroque, Study O Portable, and Aaron Young. The first solo museum exhibition of Silvestre Pestana’s work in the U.S., Breathless features an intimate view into the vast universe of one of Portugal’s most pioneering artists. Pestana’s practice, which evolved out of a background in experimental poetry, has involved forays into the realms of sculpture, video, performance, photography, and gaming over the past fifty years. These works seek to explore how humans interact with and negotiate a variety of controlling forces in the world and how art can be a vehicle for challenging those very same forces, be they technological, economic, or political. Included in the exhibition are a selection of Pestana’s earlier pieces, as well as work from later in his career. As a whole, the exhibition touches on a number of pervasive issues facing society today, from the changing state of our environment to the impact of war, all of which have continuously informed Pestana’s work throughout the course of his illustrious career.